Thanks to the predominant and untiring efforts of Rajya Sabha MP and SIS India founder, Mr RK Sinha and some major stalwarts of the security industry, in a significant move, the GST Council in its Sunday’s meeting has lowered the GST rate on CCTV and Recorders to 18% bringing partial relief for the security and fire industry. The industry was shocked when almost all security and fire products had been put in the highest slab of 28 per cent in the earlier GST notification. Making full use of the respect that he enjoys within the government and political circles, we saw Mr. Sinha visit union ministers including Union Home Minister Mr Rajnath Singh, Union Minister of State for Finance Mr Santosh Gangwar, Union Transport Minister Mr Nitin Gadkari, Union Labour Minister Mr Bandaru Dattatreya, Food Processing Minister Smt. 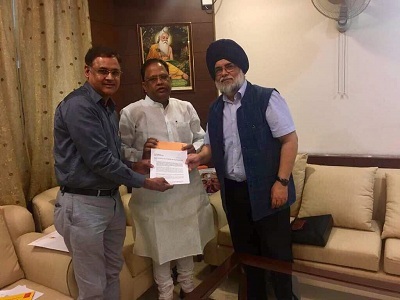 Harsimrat Kaur Badal, Finance Minister of Uttarakhand Mr Prakash Pant and Mr. Amar Aggarwal the Finance Minister of Commercial Taxes of Chhattisgarh Mr. Amar Agarwal apart from speaking to many others in a short span of a few days. The industry delegations that were led by Sh. 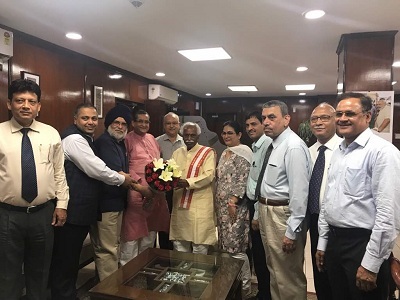 RK Sinha and other industry leaders had also impressed upon Mr. Santosh Gangwar, Union Minister of State for Finance (Revenue) to apprise him of the anomalies related to categorising and taxing Goods and Services pertaining to the Security & Fire Industry. 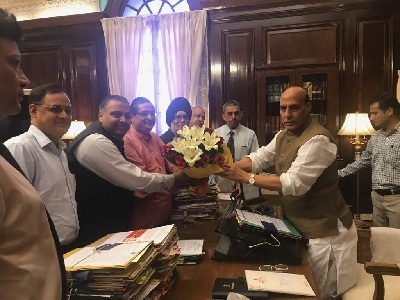 This was followed by the delegation’s visit to other union ministers in a bid to convince the government why security and life safety products did not qualify to be taxed in the 28 per cent GST slab. As a part of their efforts, the delegation had attempted to explain to the ministers that the public needs to be incentivised, as has been done in many western countries, and not penalised for investing in these essential life safety items. In fact, in Australia a GST of 10% is charged on fire & security systems and there is no/nominal import duties/tax. In Malaysia the GST is just 6%. 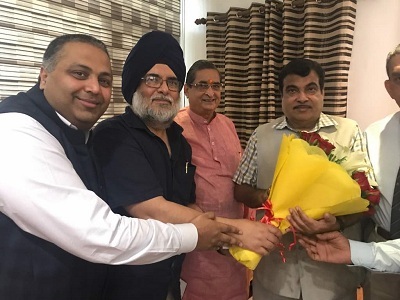 The delegation impressed on the ministers that these goods may be moved from the De-Merit List to list of Essential Items and either not charged any GST or a maximum of 5%, as is being done by 5 States. Similarly, services related to their installation and service should also not be taxed or taxed nominally, so that maintenance of CCTV, fire and other systems can be done economically. Thanks to the untiring efforts of Mr. Sinha and his ability to convincingly present his case, the delegation through its sustained efforts has succeeded in a part of its mission and is hopeful of further relief. The items that have been given relief include CCTV Cameras, Recorders, Coaxial & optical fibres cables, UPS & Power supplies and monitors under 17 inches which have been shifted from 28 per cent to 18 percent. As of now there is no intimation on fire safety products and alarm systems that were also in the 28 percent slab and the industry is hopeful of more good news on that front. A case of charging GST correctly for manned guarding services was also made out to the government, as it is felt that the present Service Tax and the proposed GST under which the Service Tax will get subsumed is being charged wrongly. At present if a security agency, for example, raises a bill of Rs 10,000 for the services of a security guard on its client, the agency charges the client 15% service tax on the whole bill amount of Rs 10,000. Under the proposed GST this 15% will be raised to 18%. The point that the industry is making is that the Rs.10,000 includes the wages, the EPF, ESI, Bonus, Gratuity, Leave compensation and other statutory benefits that it pays to the guard. These must not be taxed! What the industry is saying is that suppose the billed amount has a service charge component of Rs. 1000 out of the total Rs 10,000, then the current Service Tax or the proposed GST should only be charged on this amount, as is being done in the case of the tour operators and the advertising agencies under the abatement available to them. So, a GST of 18% on a Rs. 10,000 bill should only be Rs.180 and not Rs. 1800, as is currently happening and is likely to happen in future. It is hoped that the government will see pragmatism in this valid demand. This move will benefit the consumer as guarding services will become affordable and also lead to employment generation.